Netflix is claiming that this is to help customers out and save them money. Let’s look at the old pricing structure. Right now, we’re on the 2 DVD at a time plan so we pay $15 a month. (Well, it reflects on our bill as $16 and change. That’s probably due to taxes or something. I’ll let this slide for now.) To get a similar plan under Netflix’s new pricing structure, I’ll need to buy the $7.99 Unlimited Streaming plan and the 2-DVDs-At-A-Time plan for $11.99. Total monthly bill: $19.98. That’s a 33% price hike. Do I get anything extra for this hike? More movies than I’m currently getting? 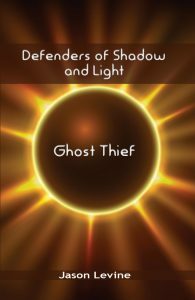 Newer releases? Quicker DVD mailings? Anything at all? Nope. I get the privilege of paying them 33% more for the same service they’re providing me now. My first thought was maybe we should reduce our plan level. We could go with 1 DVD at a time and streaming for $15.98. This would be a 6.5% price hike for reduced services. Or maybe I could go streaming only for $7.99 a month. This would save us $7 a month. Sure we wouldn’t have access to Netflix’s impressive DVD selection, but there are ways of replacing that. Bye Bye DVDs, Hello Streaming Only? Now I was confused. So I called Netflix and asked them. I was told that going Streaming Only would indeed limit the user to only one stream at a time. So if B was in the bedroom watching Netflix on our Roku and the boys wanted to watch a cartoon in the living room, they couldn’t. Or if the boys were watching their cartoon and I wanted to catch up with a show on my laptop, I’d be locked out. So much for the “unlimited" in Unlimited Streaming! Still, I wondered, how does one increase one’s available streams. Surely, Netflix wouldn’t doom everyone to a single stream. Not with Netflix on Roku boxes, built into TVs, Blu-Ray players, iPads, etc. It turns out there is a way to get more streams: Buy the DVD plans. If you buy the 2 DVD At A Time plan, you get 2 streams. The 3 DVD plan gets you 3 streams and so on. We are separating unlimited DVDs by mail and unlimited streaming into separate plans to better reflect the costs of each and to give our members a choice: a streaming only plan, a DVD only plan or the option to subscribe to both. It certainly sounds like they are making the two (DVD and Streaming) completely separate entities. 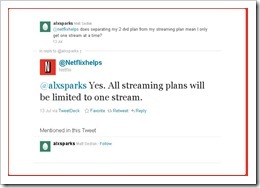 Doesn’t tying the number of streams available to the DVD plan purchased contradict this statement? I called back and asked and was told that they would forward this question to a supervisor higher up in the chain. I’ve heard some reports from people that they have Streaming Only now and can do 2 or more streams at the same time. This might be a quirk in the system or an upcoming change. Either way, I’ve got to look at Netflix company policy and not “what you can get away with now.” Even if they don’t come down on people and enforce the 1 Stream At A Time rule on September 1st, they could in the future. And that would vastly undermine the value of their Streaming plan. I’ve actually been anticipating this price increase for awhile. Back when most of the content providers inked deals with Netflix, they saw the company as a “last stop” for content. They figured that a show/movie would come out on TV/theatres and then go to pay-TV (for movies), then to DVD, then to rental DVD and then finally to streaming. Along the way, the content providers figured, people would pay each time to view their content. People would pay for premium cable channels and then buy the DVD/Blu-Rays and then pay to have it streamed. Instead, people saved their money. They cancelled their subscriptions to HBO, Cinemax and other premium stations. They didn’t buy the DVDs. They waited for the shows/movies to appear in the Netflix DVD and Streaming queues. In addition, more and more people noticed the value of Netflix and joined up. Many of the deals specified a limit to the number of people who would be signed up to Netflix and able to view the streams. Netflix blew by those numbers. Now, the content providers are seeing red. Or green. Or a mixture of both. (“Seeing grey?”) They are angry that so many people are streaming videos and want more money. A lot more. Some estimates figure that Netflix will need to pay ten times as much just to keep their same streaming content. Still, a 33%+ price increase all at once doesn’t sit well with most folks. There has been a great uproar on Twitter, Facebook, Netflix’s blog, individuals’ blogs and pretty much anywhere else Netflix users can be found. They don’t like this and many are willing to go without Netflix or downgrade their plan. This is the Netflix Apocalypse in the title. People fleeing en masse will mean fewer subscribers to shoulder Netflix’s additional content fees. This can only result in more steep price increases which would drive more people away. Netflix is at the cusp of a downward spiral into oblivion. There is hope though. If Netflix did five things, I think they could defuse this situation to a great degree. First of all, Netflix should admit they blundered. Admit that this new pricing scheme was a mistake and that, while rates will need to increase thanks to upcoming content price increases, this scheme was poorly thought out. They need to do this quickly while they still have a shred of sympathy left. Secondly, increase prices gradually. Don’t make the increase 33% all at once. I know you need to raise more money but the way to do this isn’t by slicing your customers’ jugular. Announce a series of 5% price increases that will ease everyone into the new pricing scheme. Third, grandfather in all existing users. Get rid of that September 1st date for existing users and let us keep our plans as is for now. It’s ok to say that switching plans will get you a new pricing arrangement, but give us loyal users at least six months on our existing plans before we see any pricing shift. Maybe require existing users to pay for a certain number of months up front to lock in the old rates. This would get you more money up front, keep people from jumping ship as quickly and would help keep people happier (as they’d perceive that they were getting a bargain). Fourth, fully untangle the Streaming and DVD plans. Give us at least 2 or 3 streams at a time on the Unlimited Streaming plan. 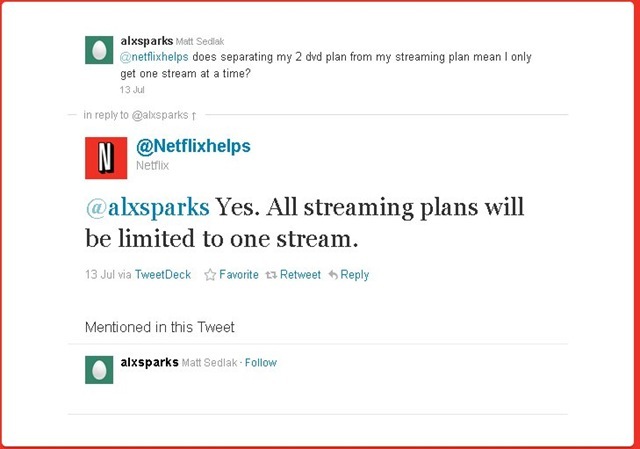 Make additional streams something you add onto your streaming plan, not something you obtain by buying a DVD plan. Fifth, give us bundle discounts. Learn from the cable companies. If you buy Internet, TV, and phone service from the cable company, they charge you less than the price of each of those service separately. This encourages people to sign up for more services. Similarly, when I sign up for Streaming and DVD plans, my final price should be less than the price of the Streaming plan + the price of the DVD plan. This will encourage people to buy multiple plans which will get you more money. If Netflix doesn’t take some, more or all of these steps, I think they’ll be facing a mass user exodus. If they delay too long, people might leave even if the September 1st deadline* is changed or even if the new plan structure is scrapped entirely. Sadly, I think we’ll be one of those leaving/downgrading. We might stick with Netflix Streaming Only for awhile, but if we bump up against that one-stream rule too much then we’ll need to rethink even that. Please, Netflix, recover from this major blunder. All of us who are leaving don’t really want to go. We love your service and want to stick around. We just can’t justify it with the changes you are making. * Although the plans change on September 1st, you might see a price increase early. When your plan renews itself, you’ll get the new rate. In my case, I was informed that this will take place on August 7th. So instead of 6 1/2 weeks to consider what we’re going to do, we have a mere 3 weeks.